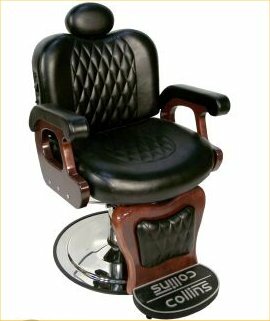 9050 Collins Commander I Barber Chair w/ cast aluminum logo footrest, mahogany finished SOLID maple arms and footrest support, custom quilted upholstery, adjustable and removable headrest, oversized heavy-duty polished chrome hydraulic base. Chair has gas-cylinder-controlled reclining back with BALL BEARINGS for smooth operation and durability. Footrest does not kick-out in concert with reclining back ... see the Commander II, model 9060, for this feature. This chair is made in the USA, not imported, and could very well be the last chair you ever buy.